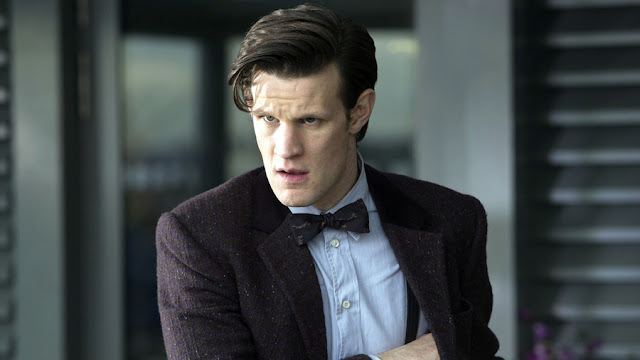 Having run down corridors from every monster imaginable, Matt Smith returns as the Doctor to face old and new foe. But he’s not alone. Along for the ride in his brand new TARDIS is the Doctor’s latest companion, Clara Oswald. Here Matt talks about what he is looking forward to from the epic new series. I think it is going to be very exciting to introduce Clara to the world and Steven has hit a real vein of form, explains Matt as he chats enthusiastically about the new series. Along with a new costume this series, the Doctor has a new TARDIS to travel through space and time. Walking on to the new TARDIS was like the first day at school, explains Matt. I actually found it quite difficult as I had got so used to the rhythm of acting on the old one, where I used to slide about on the glass floor, but Michael Pickwoad has done a fabulous job, he continues. This one is more like a machine. Having lost his first companions, the Ponds, at the hands of the Weeping Angels in New York last year and after a period of mourning the Doctor is joined by a new companion this series, played by Jenna-Louise Coleman, she’s done brilliantly well, says Matt. She’s kind, charming, thoroughly prepared and very brave as an actress. And most importantly of all we get on, which is vital on a show like this. I’m so proud of what she has achieved in the last year, he concludes. So what do fans have to look forward to this series? An urban thriller, ‘The Bells of Saint John’, brings the series back with a bang as the Doctor’s search for Clara Oswald takes him to modern day London, where wifi is everywhere. But something dangerous is lurking in the signals, picking off minds and imprisoning them. Filming for this James Bond-esque thriller took Matt to Westminster Bridge, the Southbank and St Pauls, amazing, I loved shooting in London, says Matt, there is something so brilliant about having the locations there rather than just adding them in. Following on from this the second episode, ‘The Rings of Akhaten’, take the Doctor and Clara away from earth and on their first proper adventure… in outer space. Featuring an alien market Matt remarks, it was very ‘Whoey’. We had between 50 to 60 prosthetic aliens, which is something that only really this show can offer, he continues, making it a very unique experience as an actor. As well as introducing some new monsters, the new series brings back a couple of old monsters in the form of the Ice Warriors and Cybermen, I think it’s good to pay homage to the classic series, says Matt, especially for the fans. This series we have modernised some of the monsters for a whole new generation. Soggy, like drowned rats, Matt is explaining the shooting experience for the third episode ‘Cold War’, written by Mark Gatiss. Set on a Russian submarine spiralling out of control in 1983 an alien creature is loose on board, having escaped from a block of Arctic ice. They built a submarine and the five-year old in me was like “yeah it’s a submarine!”, says Matt. I loved getting sprayed down at the beginning of the shoot, Matt continues, and it wasn’t a chore as it does so much of the acting for you, making it really authentic. Mark Gatiss has delivered one of the best episodes of the series, he concludes. Visit the BBC Doctor Who 50th Anniversary Shop!